In 2016, I read this little book called Hinges of Broams Eld by Jennifer Cano. It's a fun fantasy that brings imagination to the forefront, and features characters that I came to love. In fact, here is a little snippet from my original review . . .
Cano has created a magical world that blew her own Livy's imagination out of this world. It's a world filled with unimaginable foods that may not tempt your tastebuds, but it does tempt your desires to explore the world around you. You will see a tree and wonder what story it may hold within. You see a door and envision a place you may be transported beyond. You see an average girl and wonder what powers may be hidden within her to change the world. In 2017, I am excited to bring an amazing giveaway to all of my readers courtesy of the author! We are working together as a team to bring FIVE lucky winners within the continental US their own copy of this book to enjoy in the new year. All you have to do is complete the form below by 11:59 MST on Sunday, January 15. I will draw the FIVE winners and contact each of you via email with further instructions later that week. Best of luck to all of you! This is one book that you will want to ensure is on your TBR in 2017!! For more information on the book and the author, visit the author's website or Facebook page. 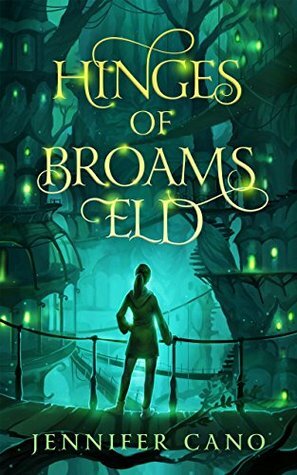 Hinges of Broams Eld was so fun to read! I am waiting for the next book to come out! Hopefully soon! I read it about a month ago and I still think about it. It is going to be another Fablehaben. Shelly Thomas ... I can't wait for the next one either! I'm looking forward to another read in this world! Deborah O'Carroll ... Your entry looks just fine, so you are good to go! Thanks for the chance! This sounds like a book many of my students might enjoy.